The chairman of the U.S. Grains Council (USGC) is optimistic about the growth of export markets for grains and ethanol co-products such as distllers grains (DDGS). 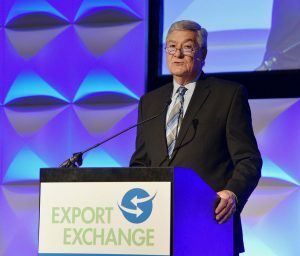 “In the 2017-18 marketing year, the U.S. set a new record for exports of feed grains and co-products for the second year in a row,” said USGC chair Jim Stitzlein, manager of market development for Consolidated Grain and Barge Co, in his welcome address to Export Exchange 2018 in Minneapolis Tuesday. Stitzlein says the biennial Export Exchange is an excellent opportunity for U.S. grain suppliers to meet with interested buyers and build relationships, which furthers the mission of USGC to develop new markets for agricultural products. The event is co-sponsored by the Renewable Fuels Association (RFA), and Growth Energy.